The Makeup Revolution Pro Brushes go mini! Made with the finest synthetic hair, these mini brushes are just what you need to keep your makeup flawless on the go. Keep the brushes in perfect condition with the little pouch! Ideal for all makeup lovers for sure! Mini Eyeshadow brush to touchup or reapply your eyeshadow. Mini Angled brush for your eyeliner or brows. Additional Information: Makeup Revolution is a London based Makeup brand with innovative and trending beauty products for people passionate about cosmetics. They offer a stunning, in-trend vast range of Makeup palettes and products that are made of highest quality, 100% Cruelty Free ingredients and are not tested on animals. Explore the entire range of Brush Sets available on Nykaa. 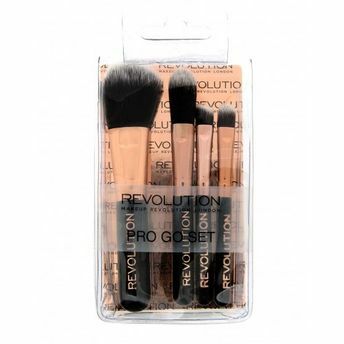 Shop more Makeup Revolution products here.You can browse through the complete world of Makeup Revolution Brush Sets .